Click here to download the Power Sonix Back Pack Brochure. Click here to download the Power Sonix Vehicle Brochure. The Power Sonix PSPAK12X2 and the PSPAK22 are completely self contained, portable, 600-watt public address systems capable of projecting clear, intelligible speech up to a mile away (1.6 Km). 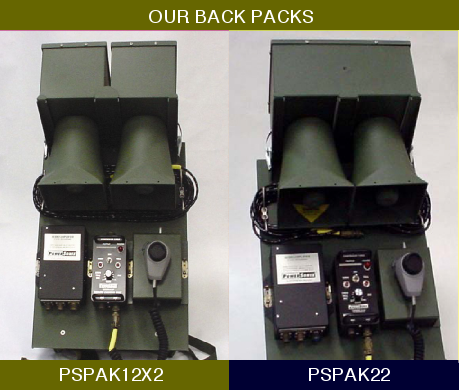 The PSPAK 12X2 has two speakers that can be individually targeted, each providing 60 degree coverage on the horizon. You'd have to have 4 narrow beam hailers to do that. Broad coverage is critical for emergency response and SAR operations, especially when there are a limited number of loud hailer assets in the field. If you can only have 1 system, this should be it for maximum tactical flexibility. The PSPAK22 dual speakers are mounted in the same enclosure and always pointed together at 1 target. This provides maximum range of voice projection for a jumpable back pack system. 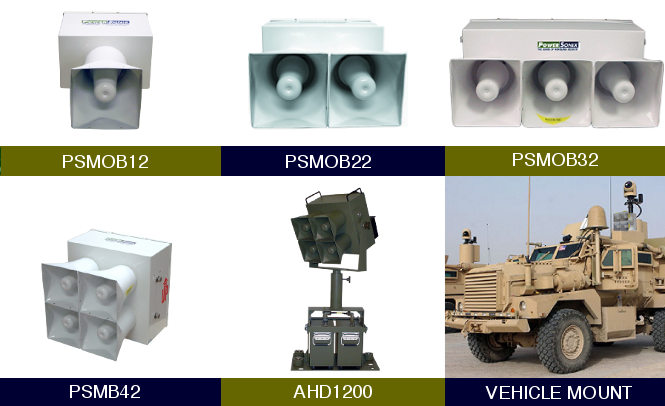 The same powerful public address technology that flies over Moscow, Beijing, Tokyo, Jakarta, Los Angeles, San Diego, Dallas and Miami is available to the Armored & Specialty Vehicle Industries through Power Sonix, Inc.
Power Sonix systems are high-powered, light weight and compact. Our loud hailers are military-grade, all-metal construction for superior ruggedness. They are light enough to be easily maneuvered and are easy to operate. Our systems are designed to give the maximum acoustical power performance with minimal weight and space requirements. This is achieved by using a high efficiency Class-D audio amplifier, low impedance speaker transducers and a 28-33V power supply. Working together, these components produce an unparalleled clear speech projection capability. We supply acoustic hailing systems ready to be integrated by OEM vehicle manufacturers or third-party communication outfitters worldwide. 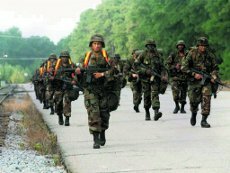 We deliver long-range tactical communications for military, peace-keeping, police, fire, emergency preparation and emergency response applications. We gladly accept, and buyers should insist upon, side-by-side demonstrations with other technologies being considered including HPV/MAD, LRAD, Wattre, Technomad Giant Voice and IML Corp Sound Commander. We outperform them all and we'd love to prove it to you.